Whoever said finding a good homestay on a shoestring budget surely hasn’t explored Hyderabad enough. From backpacker’s hostels to private rooms in a bungalow, we bring you a list of stays that give you the best of locations without going broke. Want to channel your inner mojo and run wild with your creative spirits? 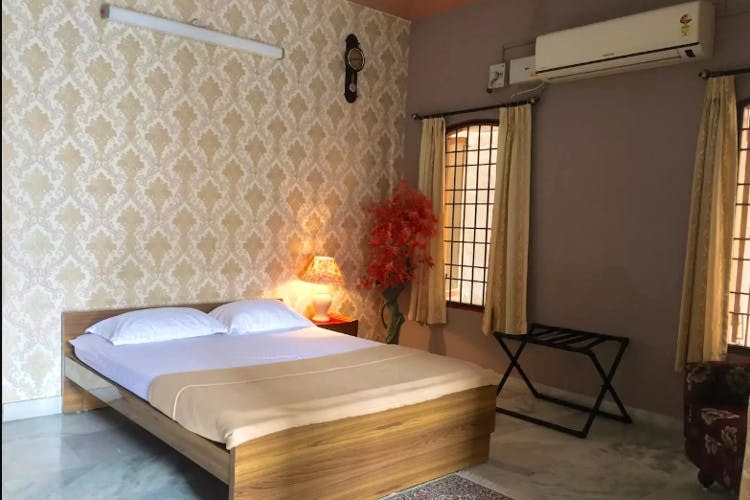 Then you must absolutely book yourself this artsy room in a bungalow which also gives you the company of lovable pets. Cascaded in the bylanes of Jubilee Hills is Artisan’s Dream Room – a private room in a bungalow. Located on top of a hill, this room overlooks rock gardens and gives you a brilliant view of over 40 km from its terrace. Find yourself in the good company of bookshelves, lofty glass windows, and lovely wooden artefacts. The private room, however, is on the first floor, and it shares similar furnishing. We’re loving the cozy bed and the bookshelf along with the table that’s stacked with paintings and books. But what stands out in the room is the handpainted wall that’s totally Instagram worthy. Think of bunk beds, amicable strangers, and epic conversations on globetrotting and exploration is what Elysium Inn Hostel is all about. Whether you’re a solo traveler or visiting Hyderabad for the first time — this is a great pad for you to crash. The living room is decked up modestly with bright handpainted tables, low jute stools, and printed cushions. The bedrooms are more of dormitories with a mix of a female dorm room, a shared dorm room, and a private twin-bed room. The dorm rooms have bunk beds while the twin-bed room has two single cots with handmade decor accents that match the living room. This makes for a great getaway particularly because it’s located in a prime area which is well-connected to the city. Although, do note that this hostel is only for travelers and group bookings of backpackers aren’t usually accepted. Beehive, a hostel, is located in a quiet neighbourhood in the otherwise bustling locality of Banjara Hills. The hostel which is located on Road No 12 is apparently a popular choice for hanging out amongst the city folk and is meant for solo travellers and families, alike. It is a 40-minute cab ride from Rajiv Gandhi International Airport in off-peak hours and is a family-run communal hostel. The hostel currently has three shared spaces — one exclusively for females, and two mixed where you and your squad can relax and socialise. The rooms are named as per the theme of a beehive, of course. ‘Elixir’, ‘Nectar’ and ‘Honey’ each accommodate up to six people in their bunk beds. Each room has its own bathroom. The space imbibes a DIY culture that is trust-based. The founders have a jar where customers drop the MRP amount for the groceries and ingredients they use from the open kitchen. Are you a pop culture geek? You might love this cozy private room. The decor of the room is a mix of antiques and European theme with several framed posters on the wall. Posters of Alien, Pulp Fiction etc. make these walls totally Instagram-worthy too. The room comes with free breakfast, a queen size bed, plenty of good books and the host assures interesting conversations too. While the room has a balcony of its own, the guests can make use of the living room, kitchen, and dining room. If you are looking for a space that’s close to Hitech City, this one’s perfect. Walking distance from KBR Park, Ricky’s Pad is a private room in a 3 BHK located in Banjara Hills. The guest has an access to the balcony, kitchen, and the common space. The AC bedroom comes with a swanky bunk bed, a bean bag, plenty of storage space and a bathtub. Whether you’re crashing alone or looking for a space along with a friend, this pad might be the right fit. The room also has a few books to keep you occupied. Gardens and ponds are the next door neighbours of this apartment so you can find yourself in a fine company of chirping birds and greens. Plus, it’s quite close to Jubilee Hills and Film Nagar, sorting all your entertainment and eating woes. Looking for a stay that’s close to the airport as well as the Old City? Then L’home — a private room in an apartment is just what you need. Qutb Shahi Tombs and Golconda Fort are a stone throw away from this property, so you can be a tourist all you like. This is a single and well-maintained room with a subtle beige wallpaper on one side. The bed, curtains and the decor match the wallpaper. Plus, an elevator takes you to the private room and you don’t have to enter the apartment to reach it. Along with free WiFi and occasional snacks, this space also offers a private balcony that you can use for evening coffee. Bring back those hostel room vibes with pin-up boards, colourful cushions, bright throw rugs and posters on the wall with this private room in a beautiful villa. This place also offers breakfast so comfort food is on the list. But what we’re loving is the 50″ 4K TV that comes with Netflix and Amazon Prime subscription. So, if you’re interested in catching up on Hannah Gadsby’s Nanette or the latest episode of your favourite TV show, just do it here. Giving you an access to all the three terraces on the property, this villa is located in a gated community right next to Hyderabad Central University.